Cauliflower puree has become very popular over the years. Here is a very simple way to make it for your residents without all the bother of boiling cauliflower and peeling potatoes. Heat the oil and pan fry chicken breasts, finish cooking in the oven at 170 degree Celsiusuntil cooked through. Combine water and CONTINENTAL Professional Gluten Free Cream of Cauliflower Soup Mix and simmer for 5 minutes, stirring continuously. Whisk in CONTINENTAL Professional Gluten Free Instant Mashed Potato Mix until thickened then add cream and butter, and continue whisking until fully combined. 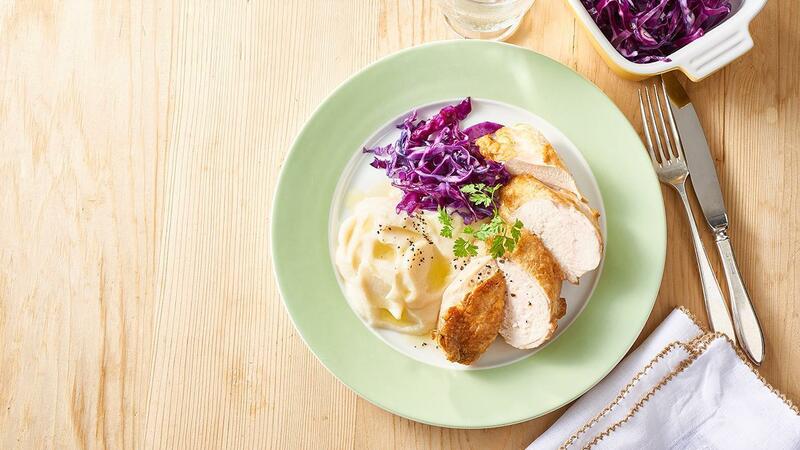 Serve chicken breasts with cauliflower puree. Skin on chicken adds extra flavour and looks great on the plate but you can use skinless breast as a healthier alternative.